We had a terrific time at SEFF 2013. This photo represents the finest moment. On Friday evening, walking down the flight line, I noticed a young man. I had taken 3 or 4 steps past him, then turned around and asked, “Hey, do you fly RC?” He replied “yes”. 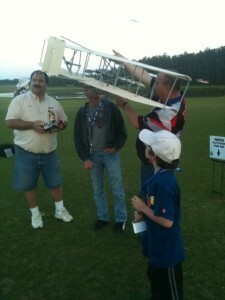 I asked, have you ever flown a Wright Flyer? He said “no”. I said, “Well then, why don’t you come out and help me fly this one? He said “OK” then I just headed on up to the flight line as I could hear him asking his dad for permission to go with me. Sure enough, when I got the model ready to go, there he was with his father. After getting the model safely into the air and up to altitude, I passed the transmitter to Cameron and he had a go at it. A few simple instructions and he was off doing a fine job. And, all the while flying the model with care and respect. His father, Dan Saegaert shot this photo of the moment. As you can see, I was having a great time! 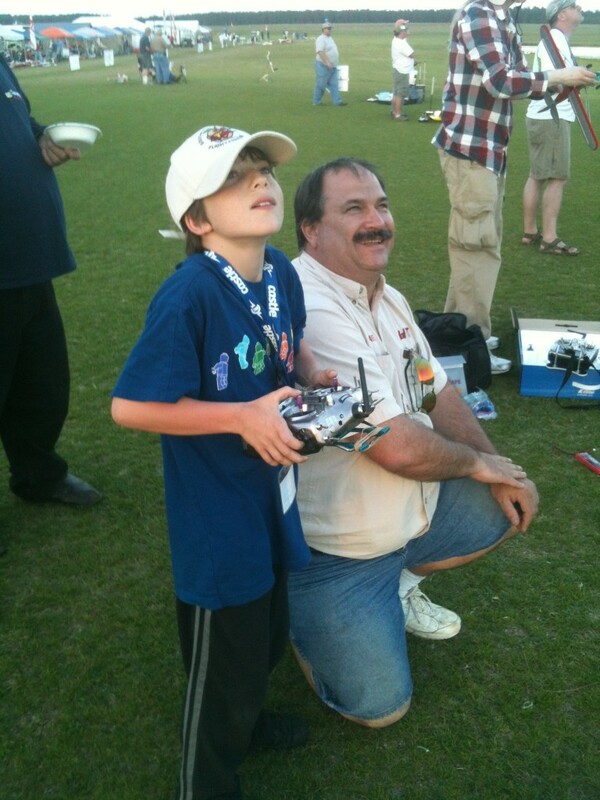 Dan told me later that his son is 10 years old and had been flying since the age of 5. Now there is some dedication and a super flying buddy as the result. Over the years, I’ve learned what a valuable gift it is to trust somebody with a model. There is a confidence transforming effect unmatched by any other experience when for the first time a young pilot is trusted with somebody else’s model. Do you remember your first time? I encourage you to snap up similar opportunities, it’s a barrel of fun. This entry was posted in Blog Entries and tagged 1905, 1908, 2013, Americus, Cameron, Dan, Flyer, GA, Georgia, Hobbies, Hodges, Mac, Saegaert, SEFF, Wright. Bookmark the permalink.